At this time of year, especially given the awful weather we’ve been suffering in recent months, our minds often wander to warmer climes and where better to wander than the Caribbean and Jamaica in particular? A beautiful island of sunshine and stunning scenery. Like Cuba, Jamaican cuisine has some Spanish influence from early settlers who brought sugar cane, citrus, coconuts, pigs, cattle and goats. Other influences, including the original Arawak Indian tribe, are British, Indian, Chinese, French and American foods but perhaps the greatest influence has been from Africa, from where ackee, a tropical fruit which is now Jamaica’s national fruit, okra, peanuts and assorted peas and beans were introduced. 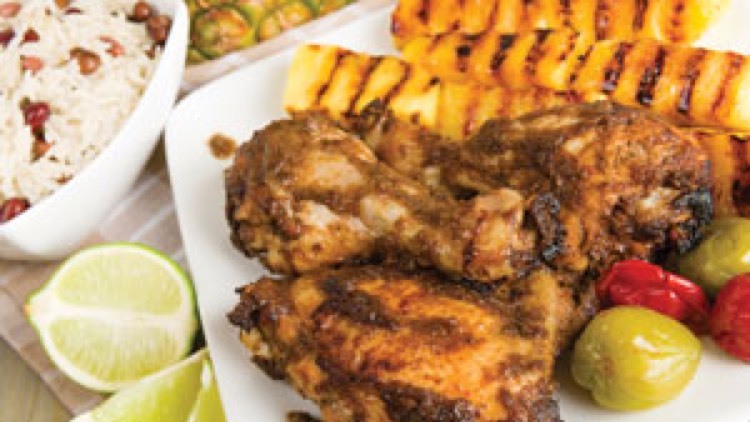 Jerk Chicken or Pork – meat marinated or rubbed in jerk spice and cooked on a Jamaican-style BBQ where it is char-grilled/smoked. Hot jerk spice includes allspice and Scotch bonnet peppers (among the hottest peppers on the Scoville scale). Other ingredients include scallions, garlic, nutmeg, cinnamon, cloves and thyme. Jamaican patties, similar to an empanada-style turnover, are popular and usually filled with meat or fish, and vegetables. They usually get their bright yellow colour from turmeric in the pastry. Curried Goat or Curry Chicken or shrimp – Jamaican curry includes allspice and a slightly different blend of spices to Indian curries including fenugreek, turmeric, star anise, coriander, cumin, anise, pepper, garlic and coriander. They tend to be slightly sweeter than Indian curries. Stew Peas, fried plantains, rice and peas. Coco bread – a slightly starchy and sweet bread made with some coconut milk and often split in half and stuffed with a patty to make a sandwich. Check out www.jamaicatravelandculture.com and click on Recipes. Brixton Market (nearest tube: Brixton on the Victoria Line) is a must-see multi-cultural food sensation and there are a huge variety of places to try authentic Jamaican dishes (and many other nation’s foods besides).